Sounds like everybody has been doing good from what I have heard! I´ve been learning a lot each week spiritually and mentally. 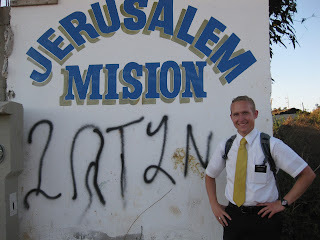 I´m starting to feel more like a missionary haha... This week has been pretty good! On Saturday we had a baptism. We were teaching the Ward Mission Leader´s younger sister some of the lessons. She hadn´t been baptized still and is 11. 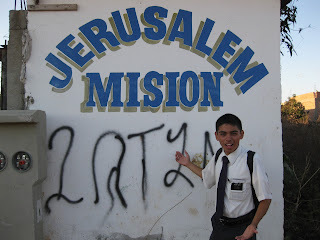 The Mission Leader, Juan Carlos, baptized her and said we did what other missionaries weren´t able to do before. Other missionaries were asking her last year if she wanted to get baptized but she said no she didn´t want to hah. E. Soto and I are still finding new people to teach which is awesome! The hardest thing is finding so many awesome people and then when Sunday comes around there´s a lot of them who aren´t able to make it to church for some reason. We taught a lot of people about the ¨Dia de Reposo`` but that´s still the main thing we want to help our investigators with. Irwing and Marisol are going to get married tomorrow! We´re going to be the witnesses so that will be fun. The day they were going to get married last week Marisol´s baby was born so we obviously weren´t able to have the get married. Everything is going good with them and the baby though luckily. Irwing is excited and we´re planning on having his baptism saturday.. There´s this cool partial member family we have been teaching this week who went to Church with us this week. We´re probably going to baptize 2 of them this month, Isabel and Maricruz. There both in there early 20s or so. We had a cool experience finding this other 2 girls to teach too, Flor and Rebecca. We taught them the restoration and they excepted everything very well. They weren´t able to make it to church unfortunately but we had a second lesson with them too. Flor prayed at the end of the lesson and she was talking about how she felt different in a really good way and wanted to learn more about Christ. She looked very happy and we told her about how she was feeling the Spirit right then. It´s the first time I´ve seen someone feel the spirit right after their prayer in that way so it was awesome. Anyways I better get going! Thanks as always for all the support. I appreciate all your prayers and am praying for everyone at home too. P.S. Some photos of me and E. Soto preaching here in Jerusalem Mexico.